Crime Prevention deputies from the Santa Clarita Valley Sheriff’s Station along with Los Angeles County Probation Department officers conducted probation compliance searches Friday throughout the Santa Clarita Valley. Several locations were searched, and the probationers were found to be in compliance with their terms of probation. During one of the probation searches in Saugus, deputies just happened to be in the right place at the right time. 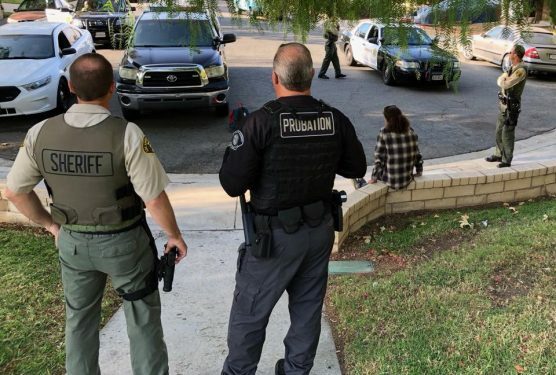 There was a domestic violence call for service that went out on the same street and the suspect attempted to leave the location — but he was surrounded by deputies and probation officers. We helped detain him for responding patrol deputies.